Our involvement with “The Golden Decade, Photography at the California School of Fine Arts” started after my father, Don Whyte, passed away in Santa Rosa, California, in 1989. He had bequeathed to my husband, Ken, his darkroom equipment as they shared a passion for photography. None of my siblings wanted to deal with all the rest of the contents of the very packed darkroom; they felt it was overwhelming and their suggestion was to throw it all in the burn can that was sitting just outside the darkroom door! Ken, a lover of all things old and historical, and especially photography related, was horrified at this and so he offered to take it all, to which everyone quickly agreed. And so it was that a few weeks later several boxes arrived at our home. 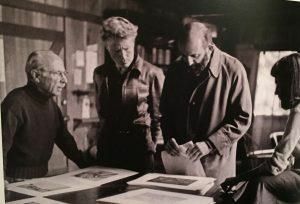 Edward Weston, Brett Weston, Ansel Adams and Dody Warren, selecting photos for Weston’s “My Camera at Point Lobos,” Wildcat Hill, Carmel, 1949. Photo by Cameron Macauley. 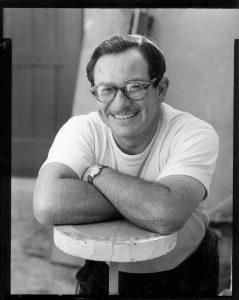 My dad didn’t talk to us about his time at the California School of Fine Arts (CSFA), but we were all well aware of his passion for art and photography. He sported several cameras around his neck, and if we were walking down a street and he was suddenly missing, we’d look around for the photo shop and sure enough he’d be in it. 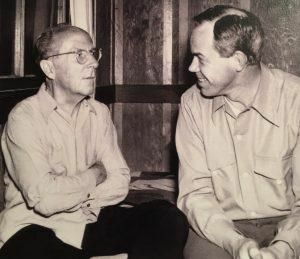 Edward Weston and Minor White, 1948. Among the darkroom contents was an inauspicious manila envelope marked “CSFA Exchange Prints” with my mother’s unmistakably strong handwriting, containing about 85, 4” x 5” contact prints, neatly mounted and signed with names like Chinn, Heick, Hollingsworth, Wallace, Bertolino, Hyde, Howell, Richter, Wallace and Whyte. We were intrigued. We had no idea at that time that the course of our lives was about to be altered! We wanted to find out more about what the images were. We re-read a draft of my dad’s memoirs, painstakingly organized from a big sack of taped together notes and lovingly typed by my youngest sister Jennifer. In these memoirs he talked about the classes at the CSFA. This is when we decided to find other CSFA students who might still be alive and our research began in earnest. At that same time, the February 2000 issue of Black & White Magazine, ran an article and photo spread about Rose Mandel by Susan Ehrens, a well-known photo historian and collector. The article mentioned that Rose was at the CSFA during the same years as my father, 1946-48. At the end of the essay was the contact information for Rose through Susan Ehrens. We made some copies of the photos we had and wrote to Susan. We asked if she could identify the people in the classrooms and field trips. Susan returned the photos with names written above, identifying all the people. They were the same names on our contact prints. Susan said some of them were still alive and in the area. We started searching for one of the people that my dad seemed to take a lot of photos of. We figured they must have been friends. Through the Internet we found all the addresses for Ben Chinn in the San Francisco Bay Area and Northern California and we wrote to all of them. 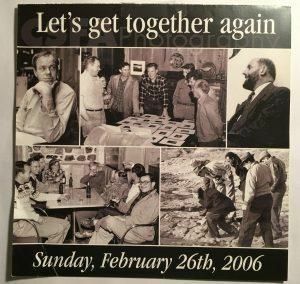 Ben Chinn, who was to become our dear friend and co-conspirator on the “Golden Decade” book, called us up a few days later. We agreed to meet at the Marines’ Memorial Club on Sutter Street in San Francisco. On February 11, 2002, we took off work and headed into San Francisco. I still remember how excited we both were as we walked up to the Marines’ Memorial. In the lobby downstairs we met Ben, and standing near him was a gentleman with very white hair who turned out to be Bill Heick. Over lunch we got to know each other. They became animated as they looked at each photo we brought and then they told us many stories about Ansel Adams, Minor White, Dorothea Lange, Imogen Cunningham and all the other photographers who were teaching at CSFA. We spent several hours going through all the photos. It was like a dam breaking and their memories flooded and bathed us with incredible first-hand accounts of what it was like to be there. It was hard to keep up with them. We all felt such joy, especially me, because I was learning things about my dad that I hadn’t known. Bill said that had just been talking about my father a few days before and wondering “Does anyone know what happened to Don Whyte?” We fell in love with them! We met with Ben and Bill again on April 10 and this time they brought Cameron (Cam) Macauley along. We showed them a copy of a book, “Selected Images, Michael Donald Whyte,” that we had put together for my family as a Christmas present. When they found out that we were graphic designers they asked if we would help them put their own book together that they’d been working on with Ira Latour for 15 years. Of course we said “yes” although we had no idea what we were signing up for. We next all met with Ira Latour and mapped out what each of us would be responsible for. Ira would do the writing, Bill would do the photo sequencing and Cam would collect and advise. 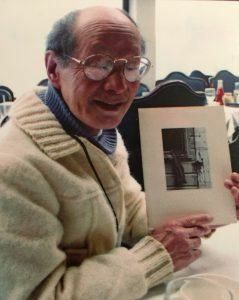 Ben, who was the one who had kept track of all the CSFA photographers and knew their addresses, would contact the other CSFA students and arrange for us to collect and scan photos from them. Ken would do the design and I would help collect and coordinate. The “Golden Decade” book project was off the ground! Then came a time of intense research. It was decided that we wanted to include the portfolios of other CSFA students so we needed to track down former students to get them to contribute their photos for us to scan plus get their biographies to include in their section of the book. The women were much harder to find because many had married and changed their names. 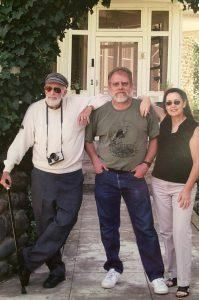 In February 2006, we arranged a luncheon at our daughter Nina’s home which was centrally located on Alamo Square in San Francisco. We invited CSFA alums from all over the country and they came from the Bay Area, Southern California, Oregon, and Florida. Many of the students hadn’t seen each other since their time at the CSFA nearly 60 years ago. That same year the book “The Moment of Seeing,” by Deborah Klochko and Stephanie Comer with the essay by Jeff Gunderson, was published by Chronicle Books. The book’s launch coincided with the 60th Anniversary of the beginning of the Photography Department by Ansel Adams at the CSFA, renamed the San Francisco Art Institute (SFAI) in 1961. We helped Jack Fulton, the head of the SFAI photo department, curate an exhibit of “Golden Decade” photography students. Kathie Lowry put together a top rate schedule of events and the exhibit was hung in the Diego Rivera Gallery, just as it had been hung at the school 60 years ago. There was also a panel discussion and several well attended meals and gatherings for the public to enjoy. The “Golden Decade” photographers came from all over the country and the school arranged for them to stay at a nice hotel nearby. Invitation to Golden Decade photographers February 26, 2006, San Francisco. 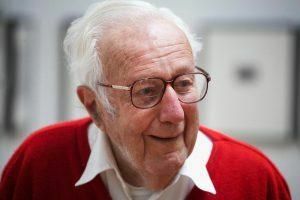 As serendipity would have it, Jack Fulton had arranged for all the photos to be taken to a gallery about 30 miles north of San Francisco in Marin County after it was taken down from the Diego Rivera Gallery. Miguel, a young artist, arrived with big packing crates to transport the photos, but I was nervous. We had collected these 100 vintage photos from the photographers, and we felt extremely responsible that they be carefully returned to their owners. Miguel could see we were reluctant to give him the photos. He said that he’d been sent by Stefan Kirkeby who was going to exhibit the photographs in his gallery. I asked if he meant Paula Kirkeby’s son Stefan Kirkeby? And he said, “Yes.” My father had helped Paula Kirkeby start her gallery in Palo Alto back in the 1960’s. I knew we were in good hands, so I relaxed and the exhibit moved to the Smith Andersen Gallery owned by Stefan Kirkeby in San Anselmo. The “Golden Decade” really launched at that point, as this was the first of many beautiful exhibits. In 2010 we finished the book and self-published a Limited Edition of 140 copies for another “Golden Decade” exhibit at Stefan’s gallery and the book sold out! 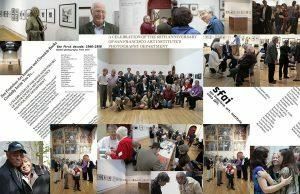 60th Anniversary of CSFA (now the SFAI) Photo Department founded by Ansel Adams. The book and subsequent exhibits would never have happened had we not been keen to take the time to look through my father’s photos and archives. Initially it was Ken who volunteered to go through everything. Watching him get excited about all the photographers and artists, sparked something in me. Looking for my father’s photo peers got me enthused even more. Then when we actually met and got to know Ben, Bill, Cam, Ira, John Upton, David Johnson, Pat Harris, Gerry Ratto, Charles Wong, Stephen Goldstine, Stan Zrnich, Zoe Lowenthal, and many others very personally. Over the years it opened a connection with my father that I never had during his life. It added a depth that I was searching for. It instilled an inspiration and drive that we needed to do the painstaking research and endless editing to follow the 14-year course from the book’s inception to its completion.Through the connection with these wonderful photographers, I’ve grown to understand my father’s passion for photography and art. I’ve reclaimed and built the relationship with my father that might have been, and I’m quite sure that wherever he is, he’s smiling. 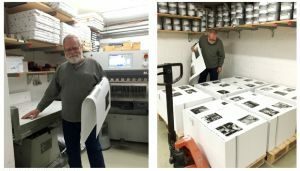 Had the darkroom’s contents not been rescued, the book, “The Golden Decade, Photography at the California School of Fine Arts” would never have happened. Nor would the many exhibits that have taken place since the book has been completed.